Enjoy the long history and vibrant notes with each sip of Aberlour A'Bunadh scotch whisky, crafted in Scotland with clear spring water from the slopes of Ben Rinnes and Lour valley. 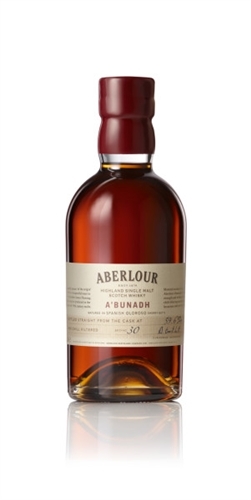 With Aberlour A'Bunadh you will experience rich aromas of spice, praline, and orange with deep notes of Oloroso sherry and hints of black cherry, ginger, dark chocolate, and a subtle touch of oak. While this whisky is versatile enough to blend with your favorite cocktails, its distinctive flavor is best appreciated neat or on the rocks in a highball glass without any added embellishments to complicate the experience. Every drop of Aberlour A'Bunadh transports you to its historic Scottish distillery where many original features still stand from its 1879 founding in the picturesque Lour and Spey river junction under the peaks of the Ben Rinnes. Aberlour A'Bunadh is a fantastic drink to sip while appreciating the beautiful outdoors or enjoying a delightful evening indoors with friends.